Information is often key to investors who are looking to gain the upper momentum to do well in their investment. You look for people who has skin in the game because they are likely to walk the talk and their credibility is often put on the line on whatever action they take. 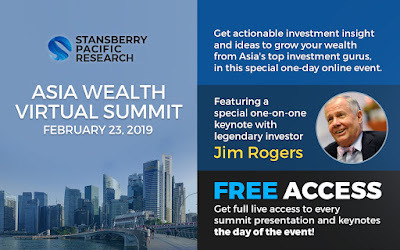 This year, Stansberry Pacific Research is organizing the first ever virtual summit where financial managers and speakers gather together in a full day event to talk about the stakes of the Asia market in the global economy. 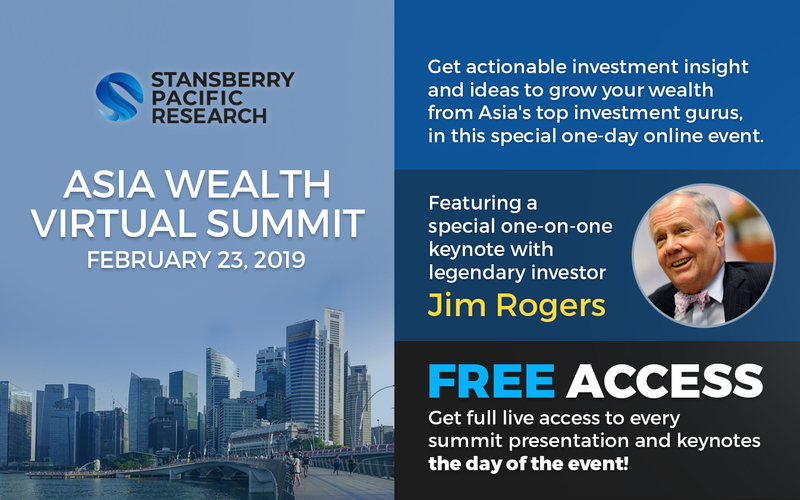 The Asia Wealth Virtual Summit will highlight ideas and insight from some of Asia's sharpest investment minds to help investors better navigate the markets in 2019 and make better decisions. Some of the top fund managers and speakers include an All-Star line up with the likes of Jim Rogers, Whitney Tilson, Harry Dent, Richard Duncan, Steve Sjuggerud, Michael Covel, Chris Macintosh and our very own Alvin Chow and Collin Seow. Registrations are FREE so if you are interested to spend your weekends gathering thoughts on how they feel about the outlook of this year market, do register for them early in this link HERE. My understanding is they are only limiting this to the first 500 registrants online in Singapore, so do sign up early for it and you'll be given further instructions in your email on how to log into the conference that day. This Summit is extendable to Regions across the globe including New York, California, Sydney and London, so I am looking forward to attending the event myself.